Following on from my purchase of Polar Capital Tech last week, I have now decided to add this global multi-asset one-stop managed fund to the mix. This £3.4bn fund invests in a mix of global shares, bonds and cash..but not property. 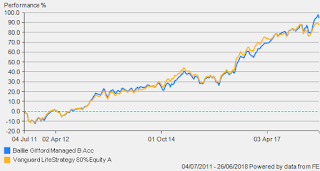 It is listed in the 40% to 85% for the Mixed Investment 40-85% Shares Sector. It tends to hold 70 to 80% allocation to shares and a bias towards growth-focused companies. Overall, long-term performance has been good and return over the past 5 years has been 70.8% compared to 43.0% average for the sector. However I would expect the fund with 70 to 80% equities to perform better than the ones with 40 to 50% equities over the past few years. The fund has ongoing charges of 0.43% and a current turnover of ~15% p.a. 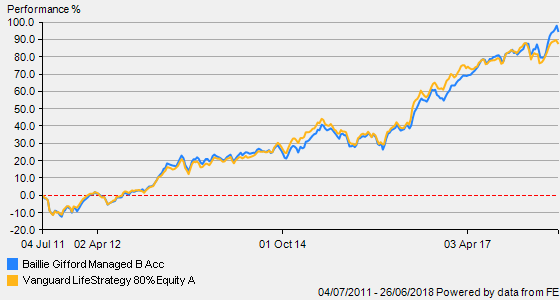 which reflects the managers commitment to long term buy/hold. I appreciate the focus on patience at Baillie Gifford which means the managers will make their assessment on portfolio holdings over a long period, maybe up to 10 years. This helps to remove the pressure to react to market volatility and peer pressure on performance. This is a global fund with a wide geographic mix of mainly equities. The main breakdown is UK 20%, USA 20%, Europe 17%, Asia Pacific 12% and Emerging Markets 7%. The rest is made up of global bonds which are a mix of government and corporate as well as around 6% in cash. 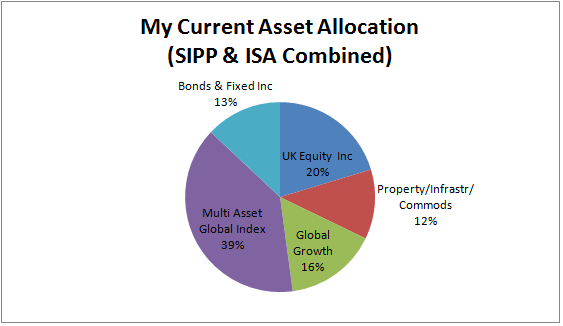 This is a managed fund so the geographic mix as well as the balance between equities/bonds will fluctuate. Some of the larger equity holdings include Amazon 2.2%, Netflix 1.1%, Facebook 0.9%, Prudential 0.9%, Nestle 0.8%, Diageo 0.7%. In addition to stand-alone equities, the fund holds several of its own funds such as BG British Smaller Companies, BG Japanese Smaller Companies and BG Emerging Markets Growth fund. This fund would certainly do a similar job to the likes of Vanguard Lifestrategy 80 or HSBC Global Strategy Dynamic as a global multi-asset stand alone option for those who are happy to keep things very simple. This fund will therefore become a part of my multi-asset core portfolio alongside Lifestrategy and HSBC Global Strategy. My initial purchase price is £10.62. I will see how things develop and compare to my Vanguard funds but may well be looking to build a larger stake in this fund over time. At the present however, I would prefer sterling to be a little higher so will reassess when the £ is back above £1.40 (currently $1.32). My asset allocation has shifted as a result of recent sales/additions and is probably best depicted by a pie chart which I will update from time to time on my 'portfolio' page. Feel free to comment below if you have any thoughts on the BG Managed fund.